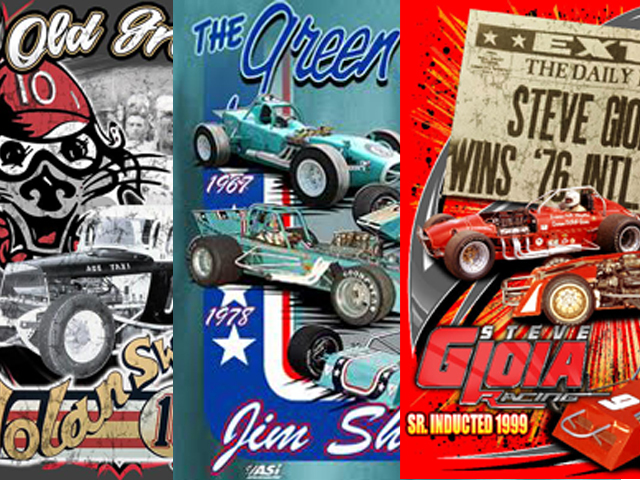 OSWEGO, N.Y. (November 15, 2016) – Oswego Speedway’s Hall of Fame Legend Series t-shirts will be packaged in a special three piece set for a limited time only starting Monday, November 28 featuring Speedway legends Nolan Swift, Jim Shampine, and Gioia Racing. Serving as a ‘Black Friday’ special, fans will be able to purchase all three shirts in a packaged set for only $50 from November 28-30, providing a savings of $10. To purchase fans can come directly into the Speedway box office between 9 a.m. and 4 p.m. during those three days, or order over the phone at (315) 342-0646. The Speedway’s full line of remaining novelty is also available in the box office through the winter months, with the Christmas season quickly approaching. From hats, to t-shirts and hoodies, seat cushions, koozies, coolers and more – the ‘Steel Palace’ has a host of Oswego Speedway branded materials for the upcoming gift giving season. Sizes and availability of Speedway merchandise is limited, please call the Speedway office to verify. Oswego Speedway’s 2017 season schedule will be available in the coming weeks.